DCO Karachi Mohammad Hussain Syed has announced exception of rent payment for blind people if they install their weight, French fries or pop corn machines in any park of City District Government Karachi. He said that special persons were important part of our society; therefore we should make joint efforts to help solve their problems. City government was also taking all possible measures to provide facilities to disable and blind people. 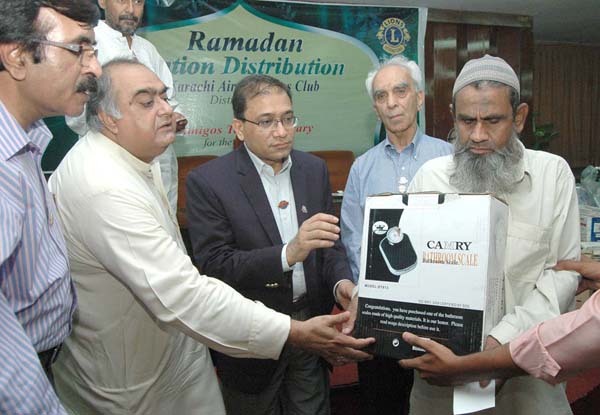 He expressed these views while addressing a ceremony held in the Civic Center’s Seminar Hall by city government and Karachi Airport Lions Club for distribution of Ramadan Ration, cloths, sewing machines, weight machines and French fries machines among blind persons including the members of Amigos Talking Library. The program was attended by District Governor 305-S3 Lion Muhammad Asad Kath, President Karachi Airport Lines Club Saeed Jumani, Secretary Lion Sarwar Hafeezuddin and other members of Lions Club.